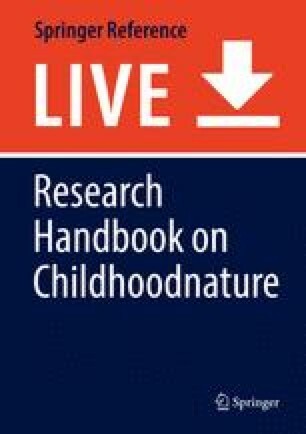 This chapter explores the roles, responsibilities, conceptualizations, and practices of parenting, through the findings of a study into childhoodnature. Childhoodnature is an emerging concept within the field of environmental education that espouses there are no boundaries between childhood and nature and that even separating the words implies a binary exists. Utilizing an autoethnographic approach and founded in posthumanism and socioecological theories, this chapter seeks to address the paucity of research that exists about parenting in environmental education and offers methodological, theoretical, and practical approaches to parenting in this context. The findings indicate that through adopting an honest, reflective approach and having a willingness to change, the perceived barriers to parenting childhoodnature can be reconstructed, reimagined, and reconceptualized. This acknowledgment of the importance of environmental education in ecologically sustainable development has been supported by the current research in the field (see, e.g., Cutter-Mackenzie, Edwards, Moore, & Boyd, 2014) and in practice by many educators. Moreover, this statement from the UNESCO report also acknowledges the significance of the family setting in the educational environment, particularly the early childhood setting. These two aspects, environmental education and parenting within the family setting, are the focus of this chapter. In recognition of the role of families on children’s learning about the environment, this chapter focuses on the significant life experiences (SLE) field of environmental education to highlight the importance of parenting in this context. The term SLE was coined by Tanner in 1980 who identified childhood experiences in nature as a key factor in determining environmental choices in later life. Since Tanner’s seminal article, the SLE field has been the focus of many researchers (see the works of Blanchet-Cohen, 2008; Cachelin, Paisley, & Blanchard, 2009; Ceaser, 2014; Chawla, 1998a, 1999; Chawla & Cushing, 2007; Fägerstam, 2012; Finger, 1994; Gough, 1999a, b; Ji, 2011; Lewis, 2007; Palmer, Suggate, Robottom, & Hart, 1999; Sward, 1999; Wells & Lekies, 2006). The recognition of SLEs is important given the current state of decline of the natural environment. Non-human nature is being altered at a rapid rate through the impacts of climate change, habitat loss, invasive species, and pollution among a myriad of other human-induced changes. Due to these changes, it has been suggested that we are now in a new geological epoch, aptly titled the Anthropocene (Crutzen & Stoermer, 2000). The key findings of the prominent SLE research are discussed throughout this chapter. Despite this wealth of research, there remains a serious dearth of information about parents’ conceptualization of nature and their perceived role in influencing SLEs for and with their children through enabling or disabling these experiences. In response to this lack of research, I conducted a study in this domain, focusing on how SLEs shaped my conception of childhoodnature from my perspective as a parent and how my SLEs influenced my parenting choices. To gain a deep understanding of the parent perspective “from the inside,” the study utilized an autoethnographic methodology. This methodological approach drew on past memory data and artifacts to reflectively analyze visual research journal entries about my current perceptions of childhoodnature as a parent (Chang, 2008). The visual research journal was constructed as part of the research and is referred to in this chapter. Through the autoethnographic research process, I gained clarity and insight into my parenting approach, and this changed and evolved during the research journey. This chapter draws on the findings of this research against a review of the literature and seeks to offer “new kinds of education” by parenting through SLEs and childhoodnature. For the purpose of this chapter, I refer to the term “parenting” purposefully as I am only referring to my perspective as a parent and the responsibilities I see in my role as a parent. I have chosen this approach to ensure that my daughter’s perspective is authentically described within this relationship. This is a different approach to that taken by O’Connor and Scott (2007), who use the phrase “parent-child” relationship to define the interaction between parent and child. The phrase “parent-child” denotes that the relationship between parent and child is bidirectional and interactive as they state that the term “parenting” denotes a one-way, top-down interaction. I acknowledge and agree with O’Connor and Scott (2007) that the relationship between parent and child is indeed bidirectional, as also described by Bronfenbrenner (1979) in his ecological systems theory. However, the term parenting more accurately describes the autoethnographic methodology undertaken in this study as I am only considering my perspective. In addition, I do not conceptualize parenting practice as restricted to biological children, although this is generally how it is used in this chapter. I acknowledge that the parent role also refers to guardians, carers, and or the significant adult/s in a child’s life. In this chapter I have conceptualized parenting primarily through ecological systems theory (Bronfenbrenner, 1979) that acknowledges the context that the individual, in this case my daughter, exists and lives in. This includes the family situation, the socioeconomic profile, the location, the culture, the religion, etc. The model in Fig. 1 describes the influence of the different factors on one another and is based on the work of Bronfenbrenner (1979); however his original work conceptualized and illustrated each system in a much broader context. The model used in this research (Fig. 1) was designed specifically for the context of this work and includes the influence of nature that was not described in the original model by Bronfenbrenner. The model in Fig. 1 also includes the influence of parent(ing) and education. The center circle denotes the social construct of childhood as the space that children live in and holds the ideas they operate under. The blurred lines between childhood and nature represent the fracturing of the childhoodnature binary to illustrate the boundaryless space that these concepts reside within. The parent(ing) sphere in Fig. 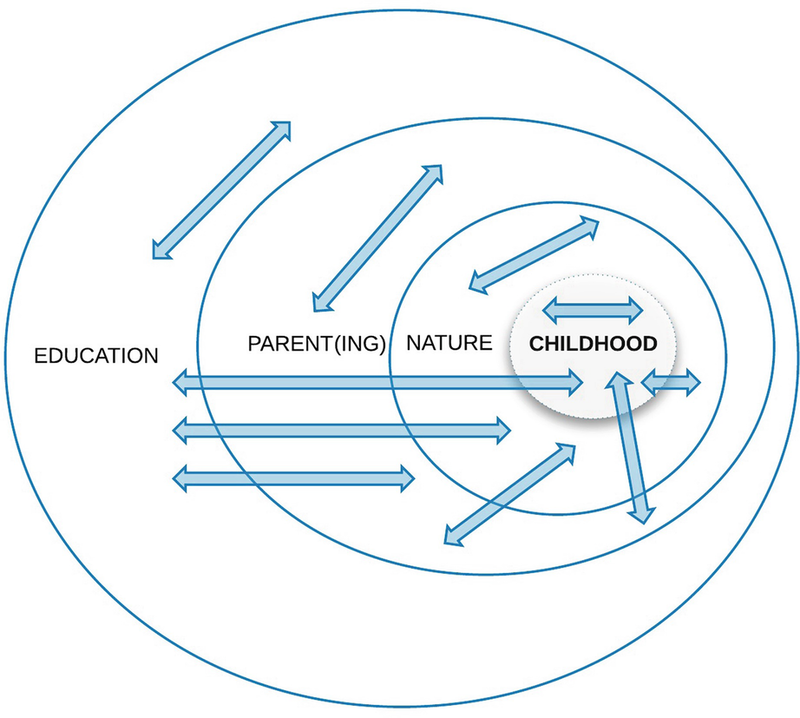 1 symbolizes the bidirectional influence between the parent and the parenting approach and the childhoodnature concept. The parenting approach that I have adopted has been fluid and responsive. I have attempted not to practice a single style of parenting rigidly, but have been open to changing my approach in response to my daughter’s needs. This way of parenting acknowledges and accounts for the developmental changes that occur as children progress into adolescence (O’Connor & Scott, 2007). Along with understanding the developmental changes that my daughter is progressing through, the way I respond to my daughter’s behavior also acknowledges the outer influences that my daughter experiences (refer to the conceptual model Fig. 1 and also the original model by Bronfenbrenner). For instance, understanding the impact of how “being spoilt” by a relative or of someone “feeling sorry” for her may change her behavior. This awareness is significant as through understanding the impact of these external influences, it is easier to understand why she acts differently at different times. This way of understanding children and their behaviors is described through social learning theory that states “children’s real-life experiences and exposures directly or indirectly shape behaviour” (O’Connor & Scott, 2007, p. 6; see also the work of social-learning theorist Bandura, 1977). I perceive my responsibility in parenting is to not react to my daughter’s behaviors and want them to change but to respond to them in a way that acknowledges that I understand why she is behaving in a certain way. Through this action I offer her an understanding of the impact of her behaviors on herself and those around her. I ensure I nominate the behavior as separate from her, so she does not identify with it. As parent and child, we reflect on the experience that caused the behavior. This process encourages, enables, and empowers my daughter to be aware of the influences of the “outer world” so she can be discerning and know she has a choice about what to engage in. I respond in this way for both positive and negative behaviors and do not profess to being an expert in this practice but see it as a work in progress. This aspect is important as children “learn strategies about managing their emotions, resolving disputes and engaging with others not only from their experiences, but also from the way their own reactions were responded to” (O’Connor & Scott, 2007, p. 6). To practice this way of parenting, I accept the responsibility of modeling this approach through being aware of my own behaviors and discarding those that do not support me, my family, or my community. However, in my parenting practice, I have adopted the approach that my daughter is an all-knowing being. My husband and I often say “you are not ‘just a little girl’; you are a person in a little body.” This acknowledges and confirms her knowledge as valuable and equal and aligns most closely with the agentic child as described through the sociology of childhood theory by Sorin and Galloway (2006). Surprisingly, given the seeming changing attitudes around the conceptualization of childhood, my daughter is often still seen and treated by adults as innocent, unknowing, and incapable (Sorin & Galloway, 2006). The impact that I have observed on my daughter is that she becomes reduced: as she is treated as a “little girl” and incapable, she begins to behave in this way too. Within the context of SLEs and I would argue outside of this field of study also, parents play a significant role in influencing and inspiring their children. This section explores some of the literature in these areas and how they have contributed to or align with my research study. Generally speaking, SLE is a field of environmental education which seeks to identify the learning experiences that shaped “active and informed citizenry” toward nature in adulthood. Chawla (1998b) listed the major variables which define the adult environmental behaviors and attitudes that SLE is attempting to foster and recreate as environmental sensitivity, “in-depth knowledge about issues, personal investment, knowledge of and skill in using environmental action strategies, an internal locus of control and the intention to act” (pp. 369–370). Since its conception by Tanner (1980), Chawla has contributed considerably to the SLE field of knowledge. In a study she conducted in 1985, Chawla analyzed 38 autobiographies to discover the type of intense environmental encounters that they recalled, the places that inspired these memories, and the effect that they see these memories had. 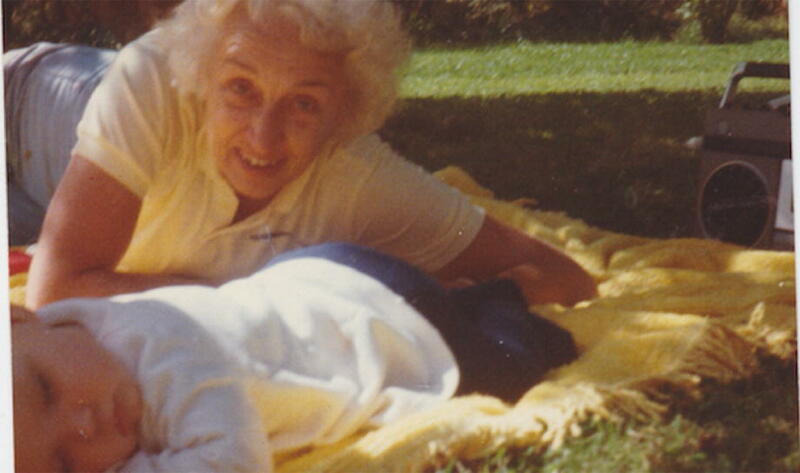 Chawla (1988) reported that autobiographical authors in her study “attributed an inner sense of calm and connection to nature to profound feelings of communion with the natural world in childhood” (p. 17). The sense of connection felt with non-human nature has been attributed to positive experience in the outdoors (Chawla, 1988). Palmer has also made substantial contributions to the SLE field through undertaking extensive international studies in association with others (see Palmer et al., 1998a, b, 1999). The findings from these studies led by Palmer, along with those from Chawla, reveal that the most important SLEs are (i) having opportunities for positive experiences of, in, and with nature in childhood and (ii) the critical influence of an adult – a parent, teacher, or other family member (see Fig. 2) who inspired “environmental awareness and behaviours” (Palmer et al., 1999, p. 199). Given these findings, there has been a severe lack of research into the SLEs of parents and how they perceive these SLEs as shaping their environmental choices and, also, how they view their role in being an inspiring adult for the younger generation. Furthermore, there are limited studies of parental conceptions of nature (see Kahn & Friedman, 1998; Payne, 2005, 2009) and a paucity of research analyzing how, where, and when these conceptions developed. Parents, however, have been included in many studies in environmental education research, generally in the educational context. One such study that demonstrated some practical and tangible guidance for parents was the research by Chawla and Cushing (2007) who provided a rich analysis of socioecological agency, democracy, and competency in children and youth. Rather than the parental perspective, they looked through the educator lens, which I argue are one and the same in many aspects. Their recommendations to educators regarding parental involvement were twofold: “reach out to parents to convey the importance of democratic parenting” and “encourage parents to take an active and supportive role in their child’s experiences of nature and participation in community groups” (p. 16). These recommendations provided teachers with a practical way of including parents in the classroom’s sociocultural values of agency, democracy, and pro-environmental behavior through personal and collective competence. The recommendations also offered parents a way to support their children to develop a connection with nature through involvement in community participatory activities and encouraging their child’s contributions. The premise behind these actions being that these opportunities in nature may provide a SLE for that child. Moreover, the underlying theme was to encourage an approach to learning in environmental education which involves the connections between child, teacher, and parent. The research eliciting the contributing factors to children not having direct experience with non-human nature were found to be spending more time indoors with digital technology, time pressures of families and educators, loss of natural spaces, and parental safety concerns and fear around stranger danger, traffic, crime, pollution, and nature itself (Foster, Villanueva, Wood, Christian, & Giles-Corti, 2014; Louv, 2006; Malone & Tranter, 2003; Neumann, 2015; Palomino, Taylor, Göker, Isaacs, & Warber, 2016; Shaw, Anderson, & Barcelona, 2015; Sobel, 2008; Sweetser, Johnson, Ozdowska, & Wyeth, 2012). Shaw et al. (2015) further developed a model by Crawford and Godbey (1987) to categorize parents’ perceived barriers to family participation in nature-based, outdoor experiences into three themes: intrapersonal, interpersonal, and structural constraints. For example, interpersonal barriers include parental time away from work and children’s scheduling conflicts. For a more detailed explanation of these categories, see Shaw et al. (2015) or original authors Crawford and Godbey (1987). The model proposed by Shaw et al. (2015) also includes the cultural aspect of outdoor participation which was clarified to mean a system of shared values and beliefs. Without a hierarchical organizational system of constraints to parents’ perceived barriers to family participation in nature-based, outdoor experiences, the influence of culture is described as an overarching theme that underpins the conceptual model. In the home in situ, the research around intergenerational influences through the parent-child relationship has also looked at the reverse phenomenon: the influence of the child on the parent in making behavior changes around the home. A recent study has confirmed that children can be the change agents, as parents of children who participated in an environmental education program were more likely to adopt sustainable practices in the home (Damerell, Howe, & Milner-Gulland, 2013). The results of my study did not draw on specific attitudes or behavior changes that occurred through intergenerational influence, but acknowledged that the entire study would not have been possible without the constant reflection and lessons that were offered by my daughter. It is noted here that SLE research has not been without contention. Gough (1999b) posed the question which has fuelled academic debate of SLE: “Do the research activities described by SLE researchers actually explore which experiences are likely to produce environmental activists, or rather, what sorts of past experiences are particularly likely to be recalled as significant by those who have, one way or another, become environmental activists?” (p. 353). This idea was considered in my research, and I did question why many of my peers who had experienced similar SLEs to me did not hold the same level of care, concern, and interest in ecological sustainability as I did. I acknowledged this critique of the field of SLE, but, given the limited scope of my research, identified that further analysis would be required to comment definitively about these concerns. Additional to this contention has been the need to discover the most appropriate methodologies for SLE research and determining if past childhood experiences can be used to create influential experiences for children today (Blanchet-Cohen, 2008; Eilam & Trop, 2014; Gough, 1999b). This creates an issue as parents’ ideas about what constitutes a SLE in nature may be vastly different to the needs of their children due to the context of the time in intergenerational differences. Criticism has also been given to the “disproportionate focus on privileged groups and positive experiences” (Ceaser, 2014, p. 205). Ceaser (2014) considered SLEs on marginalized and disadvantaged groups and found that negative experiences (i.e., emotions such as fear, helplessness, and guilt) play a much greater role than positive experiences in determining environmental activism and justice in adult life, as does the embodied learning of these experiences. Similarly, Hsu (2017) found the negative experience of “losing a beloved natural place” ranked third of the eight most crucial factors for environmental action in the rural areas of Taiwan (p. 51). This millennium has seen a new wave of SLE research, which has branched out in many ways. These include and investigate the role of personality, schooling, and community and compared the influence on behaviors with attitudes (Eilam & Trop, 2014). Research has also been conducted “on the meaning of both social disadvantages and negative environmental experiences” as motives for practical concern (Ceaser, 2014, p. 205). A study by Ceaser (2014) also highlighted the need for researchers to consider the influence of environment, society, and history on SLEs (Ceaser, 2014, p. 215). Moreover, through SLE findings, it has been recognized that environmental education programs need to be assessed not only by cognitive responses but also affective responses (Cachelin, 2009; Pooley & O’Connor, 2000). Classified separately to SLE, but also related to lived experiences, is the study of the life course path that identifies “interwoven pathways or trajectories” which together form a life story (Wells & Lekies, 2006). Life course path demonstrates similarities to SLE, such that it builds on previous SLE findings that there is a relationship between childhood experiences and “adult attitudes among environmental professionals” (Wells & Lekies, 2006, p. 13). The findings of Wells and Lekies’ (2006) study were concurrent with SLE research that childhood experiences in non-human nature link with both environmental attitudes and behaviors in adulthood (Wells & Lekies, 2006). The study by Wells and Lekies (2006) called for further research from this field specifically identifying the need for longitudinal studies that focus on “exploring people’s relationships over time and during various periods of life” (Wells & Evans, 2003, p. 327). Finger (1994) used the phrase “life-world approach” to describe his research, which is fundamentally based on SLE. The findings reflect the similar trend discussed earlier that “the main factors predicting environmental behaviour, or absence thereof, are experiences in and with the environment (e.g., previous environmental activism, experiences with nature, and exposure to environmental catastrophes)” (Finger, 1994). This section presented a scoping review of the SLE literature, drawing on parenting as a focus. It was discovered that the two major findings from this research named childhood experiences in non-human nature and the influence of a central adult as key determinants of lifelong attitudes and approaches to environmental behavior. The latter finding is significant as it forms the central foundation of my research: exploring the role and influence of the adult. The next section of this chapter explores these findings through the context of a parent(ing) conceptualization of childhoodnature. Through my recent autoethnographic study titled Parent(ing) Childhoodnature, the extent to which SLEs mediate parent(ing) with/as childhoodnature was explored (for full details of the methodology employed and theoretical framing for the study, see Blom, 2016). 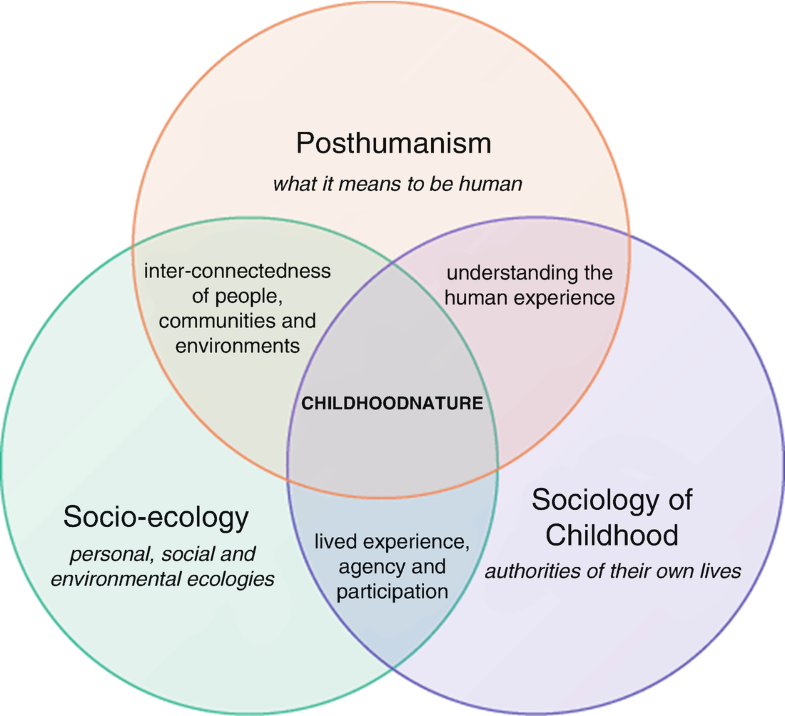 The theoretical perspectives of posthumanism, socioecology, and the sociology of childhood were utilized to frame the study (refer to Fig. 3). This angle allowed the distinctions between childhood and nature to be blurred to expose the possibilities that can be enabled through this process; so that there is nothing in between and nothing to separate, it is united: childhoodnature (see Fig. 1). Prior to conducting research into an approach for parenting childhoodnature, it was necessary to gain a deep understanding of how I, as a parent, conceptualized nature. To do this, I drew on my SLEs to explore the impact they had on how I related to and understood nature. What emerged was a complex and varied response to experiences with nature revealing a deeper understanding of myself as being with nature, but also as nature. The autoethnographic approach enabled this deep and reflective response to the research questions. Furthermore, it allowed the parent’s perspective to be explored through intimate and in-depth research. The findings of my research foray were not a neatly laid-out linear map as I had envisaged but a messy assemblage of current memories at times juxtaposed with artifacts from my past. The research found that to conceptualize nature, it was first necessary to develop an understanding of self through honesty, identifying values and an awareness of the images and pictures I operated under which, in effect, governed my movements. Second, the role of nature observations and interactions was identified as a key factor in conceptualizing nature. My first purposeful foray into non-human nature as part of my research was taking a walk with my daughter in the local park. I came up against the barrier of time: experiencing the difficulty of relaxing into the pace of life on this outing. Through this experience I became aware that I needed to be deeply reflective and develop greater honesty with what I was feeling in each moment. From this walk in the park with my daughter, I was able to discover that non-human nature is much more than the scientific view of an interconnection of living and nonliving things; non-human nature offers space to support growth and development. Through the deep interconnection between human and non-human nature, nature has a knowing. It is there providing a sensory experience which I can choose to connect with and observe the wisdom that it offers. At the same time, non-human nature allows me to simply be and feel. After dinner [my teacher] had a chat with me and I began crying again. Why do I cry? I calmed down and walked up to the common room. After being there for five minutes, I began crying again. I kinda [sic] know what [it’s] about and it’s too hard to explain in the dull light of this torch. I decided to go for a walk to the gate. On the way I saw [my teacher]. He asked if I was alright? I said I was but he didn’t believe me. He could tell I was unhappy inside even if I did put on a happy face. At the gate, I looked at the stars and thought about this beautiful place. In my memory, the actual standout moment was not the tears beforehand but the blanket of stars above my head that reminded me that I was part of something much grander, more awe-inspiring. This reminded me of Carson’s (1965) musings about the importance of connecting with the awe and wonder of non-human nature through the “recognition of something beyond the boundaries of human existence” (p. 88). This reflection contributed to understanding my conceptualization of nature as I began to explore my human body as a continuation and part of non-human nature. I perceived the tears as “clearing the ground” of my body-as-nature allowing the learning moment with the stars to occur. Just as Carson (1965) shared “the Maine woods never seem so fresh and alive as in wet weather” (p. 30), through the crying process my body became “fresh and alive” in a similar way, open to the messages and offerings from non-human nature. I questioned why I would refuse to allow myself to cry and to experience the lovely lushness in my body akin to the freshness of a rainy day. I concluded that it was due to the façade of two social norms: (1) what it looks like to be “okay” and (2) that as a woman I need to be superwoman i.e., to do everything and come out smiling. As I have grown, I have come to know that I am superwoman regardless of what I do and what it looks like. I don’t have to hide behind a mask of pretense. I can be honest about what I am feeling, and this is what being brave and what being a superwoman is really about. Through honoring what I am feeling, I am nurturing nature: my body-as-nature. Furthermore, through this internalization of our individual selves into mental activity, there is danger of becoming disassociated with the physical world such that our society is “increasingly governed by its own internal dynamics and attempts to deny our ultimate dependence on natural processes” (Kidner, 2007, p. 139). These ideas align with my understanding and conceptualization that it is through connecting with our body-as-nature that we can more easily access our biophilia (Wilson, 1984) and feel the deeper sense of connection with non-human nature. Bai, Elza, Kovacs, and Romanycia (2010) support this view in the educational context by stating that education needs to bring children’s attention to themselves through “being sense, being bodies, being perceptions, being feelings” (p. 36). They suggest that we are educating children away from their biophilia through a “consciousness that is busily and excessively into ‘doing’ and ‘having’, however educational” (Bai et al., 2010, p. 360). Through adopting a critically reflective process about the social constructs I am a part of and honestly considering the influence these ideas have on my daily practices and movements, I am more easily able to let go of these strongholds of society and live more attuned to the song of nature. I likened this to the work of Latour (2004) who proposed that we no longer accept the value-fact divide if the collective we of nature (both human and non-human) are going to reconceptualize nature and society in a unified perspective. Through this exploration it became evident to me that I needed to let go of what I had accepted as environmentally sustainable and actions “for the environment” and radically open my awareness to the possibilities of what nature was and what a sustainable relationship with nature looked like. I further explored my values by reflecting on past behaviors and choices that did not support or nourish me. When life became overwhelming through poor choices that did not care and nurture my body-as-nature, I was able to restore my sense of emotional, mental, and physical equilibrium through time connecting with nature: generally by going for a swim in the ocean or a walk in the forest. By reconnecting with my “biophilia,” I felt myself again. I deeply appreciated the gift that nature offered through this process while at the same time the influence of significant adults, such as my grandma (see Fig. 2), for sharing the magic of non-human nature with me during childhood. Over the last decade, my relationship with nature has drastically changed. I no longer seek refuge and escape into nature as I once did. I now understand nature as my parent and appreciate the way nature interacts in my everyday life: from the little ant walking across my desk to the flash of a rainbow lorikeet’s belly or the seemingly endless sky with clouds that appear painted on in their awe-inspiring perfection. I value and appreciate non-human nature for all of this, more so now than ever before. Nature provides a little reminder to support my biophilic connection when at times I feel like a mind in complete disconnect from the body that houses it. It is through feeling my body and remembering that it belongs to something much grander than merely the individualized self that I can be in harmony within myself and with all other living things. The choices I make now are aligned with and respect nature more than they ever have been before. I consume less and live more within nature’s cycles. Most importantly, I now understand that my body-as-nature is my and only my responsibility, and thus I treat it with the utmost care and love. I now have the intent of treating all others in this same way. The idea that the human body and non-human nature are conceptually united has been discussed by many researchers, for example, Latour (2004), who states that through the very notion of conceptualizing and conserving nature we are separating ourselves from it. This unification is grounding of the childhoodnature philosophy that proposes that there is no distinction between the concept of childhood and the concept of nature: they have a deeply innate connection to their biophilic source. Developing an awareness of this connection and honoring this internal biophilia is something I value. I now know I no longer need to retreat in the untouched landscape to connect back to this feeling, for it is within me, my body-as-nature. Images and pictures were the third concept presented through my data on conceptualizing nature and are founded on expectations. These expectations generally stem from societal ideals and beliefs that are so ingrained; often it is unclear that I operate under their guise. When I was in my twenties, I became acutely aware of how these images and pictures could be destructive in setting up a framework for disappointment. It was at this time in my life that I renounced many social traditions and norms such as a need for marriage, children, and getting a mortgage on a home, a car loan, and so on. I saw the detrimental effects these images and pictures had on people in my life so decided not to engage in them. We woke up to nice but windy morning. I felt like the tent was about to fall down or blow away. After we got up we went and sat around the gas stove. We had breakfast, it was bread and jam. The wind kept blowing sand into the food. Again it was beautiful weather, apart from the wind. The lake water was no longer fresh, it had sand and everything that had blown into it. We had to back-track along the beach. Even though we’d seen it before it was still unreal and beautiful. The past reflections from my early adolescence are vastly different to my current memories of what that moment was like. The past reflections are devoid of what I remember now about the complexities I was experiencing as a teenager in a remote, highly socialized setting. The past reflections do not describe the depth of beauty that I felt being on that isolated, wild beach nor the impact that being in that place had on my well-being. These aspects are highlighted in my current memories of these moments. Through the process of contrasting this writing with my current memory of this SLE, many conclusions can be extrapolated. One is that even though I did not describe everything in detail at the time, it could be that my expression has changed as I have developed from a girl into a woman. As Muncey (2005) stated “although memory is selective and shaped, and is retold in the continuum of one’s experience, this does not necessarily constitute lying” (p. 70). The differences in data representation do not deviate from their validity. Memory is an important and unique source of data (Chang, 2008). Chawla (1998a) supported this through her SLE research by advocating that memories are generally accurate around the general course of events, whether a single or repeated experience. Another reason for the discrepancy between the two descriptions of the same event is that somewhere in the space between adolescence and early adulthood of my late teens and early twenties, I constructed more complex ideas about what non-human nature meant in my life. These were formed through observations of and interactions with non-human nature and are explored in the next section. So far in this chapter I have conceptualized nature through the lens of a parent and conceptualized nature as a parent. Nature has been shown to be inextricably linked with developing my relationship with self. This exploration is evident throughout my life path and has been a necessary part of resolving the tension I have felt in the current state of the natural environment. As reflected by Orr (2009), we need to answer the question of “who we are and what do we know of ourselves?” to get to this resolution (p.184). Through my reflective approach to understanding my connection with nature, I have observed how this conceptualization of nature has changed significantly along my life path and changed the direction of the path too through SLEs. I draw on another example from my 14-year-old self on the school-based remote learning program to illustrate the influence, impact, and meaning-making of SLEs from a retrospective viewpoint. When I first came to this place the environment was everything around me – the forests, the village. It was a special, new place. But to me it didn’t mean much – it wasn’t my environment to worry about. I didn’t know much about the forests – so I didn’t care much. Through my time here I’ve learnt and thought about what’s around me all the places and what they mean to me. I’ve become more aware about everything I do. Because nearly everything I do here will make an impact on the environment – the water I use and the rubbish I make. I’m hoping to use some of the things I’ve learnt when I return back to the city. Because my environment in the city is as important to me as this place. Through reflecting on my past experiences of the school-based remote learning program, it is evident that as a collective SLE, it provided a key to my connection with both human and non-human nature. It also gave me the knowledge and skills to enable authentic agency in the practice of caring, advocating, and actioning for the natural environment. Kollmuss and Agyeman (2002) assert that direct experiences (such as seeing the impacts of logging firsthand) provide a stronger influence on environmental behaviors and attitudes than indirect experiences (e.g., learning about an environmental problem in a classroom), which focus on the dissemination of knowledge content of environmental issues. The school-based remote learning program provided a combination of these strategies which may have contributed to the success of this approach in enabling a SLE. While the school-based remote learning program was definitely a major shifting point in my life, there were many more SLEs that continued to occur as I completed high school and moved into and through my twenties. The learnings from the school-based remote learning program held strong, and I continued to care and advocate for the environment; however, this had become problematic as I had developed a practice of caring more about non-human nature than my body-as-nature. This idea has been attributed to environmental guilt and has been experienced and observed by researchers (see, e.g., Schneider, Zaval, Weber, & Markowitz, 2017). My next major SLE occurred in my early 30s. I was feeling exhausted by the endless inner conflict between being a citizen in a consumer-based society and being true to my environmental sustainability beliefs. I thought that there must be another way. So I retreated from my seaside residential life into what some may call “the Australian dream”: my husband and I purchased a four-wheel drive and a camper trailer and went traveling around Australia with our 18-month-old daughter. After working in some remote areas and being “on the road” for 6 months, we realized that this way of living was not financially nor practically feasible or sustainable long term. We relocated and I began resolving my inner conflicts about being a part of society and living sustainably. The process I adopted to do this was to first accept that “retreating” from society did not work, and second, I let go of everything I thought sustainability was about. From the outside, I would not have looked the picture of someone who cares about the environment. But, on the inside there was resolve. I approached my environmental and sustainability actions through caring for my body-as-nature first. Only through practicing caring for my body-as-nature was I able to begin to understand what it meant to care for non-human nature. This idea was supported by Parker (as cited in Skamp, 1991) who asserted “If I am uncaring of myself, I am careless of my environment and my sister creatures” (p. 82). I came to realize and understand that my body is made of the particles of the universe, which includes the natural world. My body can work in alignment to the rhythm of this universal order, just as is observed in nature. I am the one who knows and has control over my body, so it is my responsibility and choice to listen to and look after it in a way that respects the universality to which it belongs. Moreover, my body has a way of communicating exactly what is needed. It is my choice to remain open to listening to it, in the same way I “listen to” the nature outside of my body, non-human nature. I grew up in a leafy, city suburb in Australia, with only intermittent opportunities to experience wild nature. Given the profound support non-human nature provided me, I was determined to ensure my daughter had much more exposure and time in non-human nature than I did as she grew up. I was sure that I would be the significant adult in my daughter’s life who would provide her with opportunities to be in wild nature. This picture I held was just another ideal about how I thought things needed to be and what they needed to look like. Trying to live in a way that allowed my daughter to live the idealized childhood spent in non-human nature was not working financially, emotionally, or mentally for our family. I realized that to be a change agent I needed to actively engage in society and be a part of what I had always resisted and retreated from. For me, this was a major turning point in my life that could be described as an unconventional or nontraditional SLE. I started to make changes and critically reflected on some of the sustainability and “green” ways of living that I had adopted. I explored my relationship with food choices; I challenged the concept of time and I reflected deeply on the way I parented my daughter. These concepts are explored in greater depth here. Food is a sensitive topic for discussion as there are often strong emotional, social, and cultural connections with what and how much we eat. However, despite the discomfort and awkwardness that this topic might arouse, it is a necessary aspect of sustainability, environmental education, and understanding parent(ing) from the childhoodnature perspective. Moreover, food is part of caring for our body-as-nature and is in our direct locus of control. I recall personal SLEs that are specifically related to food, which have also formed my beliefs about what it means to be sustainable and nurture childhoodnature. Looking at food choices through the SLE lens, I can identify two SLEs that have strongly influenced my food choices. At age 8, I ate a chicken nugget and was shocked to realize that there was a bone in it. Up until that point I had not deeply considered and acknowledged that a chicken nugget was actually from an animal. As my father was vegetarian, it was a simple transition for me to become a vegetarian in our family landscape and my parents accepted my choice. My second SLE around food choices occurred at age 31. My daughter was 2 months old and I had developed mastitis three times during this period. It was a devastating experience for the pain I experienced, the discomfort for my daughter, and the impact it had on me as a woman. At this point, I decided to stop eating gluten, dairy, and sugar to see what impact it had on my health (as I had dabbled with this way of eating in response to other health issues in the past). After changing my diet, I did not get mastitis again. I actually felt so good from eating this way that I continued, even when I had finished breast-feeding. I continued to experiment with my diet and became aware that certain foods were causing bloating, raciness, and/or tiredness. Due to the discomfort of these side effects, I was willing to no longer eat these foods. After a few years of eating in this way, I started to hear the voice of my body through craving chicken and lamb. It was a challenging time to let go of the environmental and sustainable belief of vegetarianism that I had held onto for over 25 years, but in line with my decision to explore new ways of being sustainable, I chose to honor my body and renounced my vegetarianism. I thought my body would react to the meat and find it difficult to digest. But it was the contrary; my body reacted well and had no side effects, except for greater vitality. This was also observed by White (2013) who found that eating meat restored her “healthy body” after a year spent as a vegetarian (p. 129). Choosing to eat in this way has not been simple, but mainly through the social pressures I have felt and had to confront. It involved a process of letting go of what I had accepted as the social norms of what “healthy and sustainable eating” meant and being brave and trusting enough to accept that the changes I was making were the right choices for me. It gave meaning to the quote by Thoreau, “let your life be a friction against the machine” (as cited in Devall & Sessions, 1985, p. 8). The experience was reminiscent of my choice to become vegetarian at age 8 when it was much less common, especially for a “child,” but the intensity at age 32 felt much stronger. Even writing this now I can see how challenging it is to accept that my body does not lie when it speaks. Even when what it says is in direct opposition to what I am being fed by society, such as the recommendations from the government. I problematized the current government nutrition and lifestyle recommendations through a collage in my visual research journal. The collage troubles the Australian healthy food pyramid and physical activity guidelines. These documents are designed to provide parents and educators with support in providing healthy food and lifestyle options for the children in their care. However, during my research process I questioned this advice considering the current “obesity epidemic’ (WHO, 2000). It would seem that these promotions are not a sustainable solution for human and non-human nature. I decided to listen to the voice of my body-as-nature and for doing this, I have never felt better. I would argue that the way I eat now is more sustainable than it has ever been – both for my body-as-nature and for non-human nature. I have become aware how nature is parenting me about how to eat and live through what I observe in animals. Animals don’t worry about killing each other for food. They innately listen to their body: what and how much food their body needs without intellectualizing their diet. I propose that this could be a new approach to exploring sustainability in food choices. There is a lot of responsibility as a parent to ensure that my food choices and my relationship with food model that which I would want to see for my daughter. I see this responsibility as another reason to choose my food based on what my body tells me, as this is how I would like my daughter to develop a relationship with food: through discerning and making choices for what works for her body. Perceived lack of time is a notable barrier for parents in giving their children access to and experiences in nature along with seemingly busier lives of children, families, and society (Louv, 2006; Malone, 2007; Sandry, 2013; see also “interpersonal theme” in Shaw et al., 2015). Given that SLE research suggests that childhood experiences in nature promote future life paths into personal care and concern for the natural environment and careers in the sustainability and environmental education fields (Chawla, 1998b, 1999; Palmer et al., 1998b), it is an area that requires attention. This concept is explored in this section through a recent SLE from my research data. When he is with her, he is with HER! He is not thinking about what he could be, should be, was or will be doing. He is listening to her, celebrating her, offering her his wisdom of lived experience, appreciating her wisdom and makes space in his life to do things together. It is not about what is being done, but understanding the importance of being with each other. My husband realized that he did not have a lot of time given he was working full-time and studying part-time, so he challenged quantity by offering depth in his quality. The quality spoke volumes. I could see very clearly that connectedness was not about having to spend lots of time doing something, but was about the way that it is done: it was about the quality and not the quantity. The same idea applied to my husband’s interaction with nature. He deeply appreciates nature in his everyday life, but does not need to retreat into non-human nature or spend a lot of time there. He honors and respects his body and treats it with great care, just as he does with non-human nature. Through this observation, the concept of time has been fractured in its intensity. While it is obviously still an important aspect of being in society, it should not govern our thoughts and movements. Moreover, it should not be used as a reason not to engage in building relationships with each other or with non-human nature. We can appreciate the time we have without guilt or regret or wishing away life by wanting to be somewhere else. This lesson has been fundamental in reconceptualizing how I parent, particularly with the current wealth of images and ideas about what getting children back into “non-human” nature should look like. Through reconceptualizing time, I am able to practice parenting childhoodnature through the quality that I parent with and not on the quantity of time I have available. These ideas around parenting are developed in the next section. This section explores some of the reasons that may hinder the seemingly simple twofold actions described through SLE research of (i) providing children with opportunities to connect with non-human nature and (ii) being a role model: inspiring children through living the choices we wish to see in the world (Chawla, 1998b). It has been suggested that a major reason that children are not given permission to play outside is the “fear factor” – the fear of stranger danger and the fear of judgment about bad parenting practices from others (Louv, 2006; Malone, 2007; Ridgers, Knowles, & Sayers, 2012; Shaw et al., 2015; Sobel, 2008). Through my research, I explored this by reflecting on an experience in the backyard with my daughter. I was hanging out the washing while she was on the trampoline. When I had finished I went to go back inside to check the dinner. My daughter was clearly enjoying herself but hurried to put her shoes back on to come back inside with me. I asked her why she did not want to stay outside on her own and she said she was scared. The way she rushed to get off the trampoline certainly confirmed this. I pondered on this event to work out why she would have been afraid. As we do not have a television, I knew there would not have been an image or picture constructed about stranger danger from a television program. I had never told her stories about kidnapping or instances of children being lost. I realized it may have come from my movements, in the way I watched her closely. It was my own fear that my daughter felt and took on as her own. By doing this, I had created a need from my daughter. I realized that if my daughter did not need me, then what was my role as a parent and mother? Through the actions of constantly watching my daughter and making sure she was safe, I was in effect saying to her, “you need me to be okay.” I know my intentions were to ensure my daughter was safe, to be a good parent, and to spend time together, but at times I know these actions conveyed an underlying message that my daughter is “vulnerable, incapable, and in need of guidance and protection” and thus a “welfare dependent” (Barratt & Barratt-Hacking, 2008, p. 287). This view of children is opposed to enabling and empowering children to be the “young citizens” that they are through honoring their “strengths and competencies” and providing them with appropriate “recognition, respect and participation” (Neale as cited in Barratt & Barratt-Hacking, 2008, p. 287). This required me to change my parenting perspective: from seeing my daughter as someone in need of protection to empowering her as a young citizen, not as belonging to me but as being her own being. My husband and I continue to remind our daughter to share and act on how and what she feels and to ask questions from her inner knowing. I can see how this approach supports and empowers her in making choices and remaining in connection with her biophilia. It is quite revelatory to know that I do not actually have to do anything: that my role is to inspire. I understand the practicalities of doing the things for my daughter that she is not yet able to do and therefore supporting her development in the practical sense; but I am also acutely aware of her capabilities as she grows. Children are so much more able than I regularly see them being given credit for. Knowing that I do not have do anything is not an excuse or a way out of parenting my child, but a way of reimagining what parenthood looks like. This way of parenting is about making decisions and movements through taking care with myself and connecting to my daughter as a first priority. To transition my parenting from one of need and busyness to one of connection with myself and my daughter first requires honesty and acceptance. I propose that through letting go of any beliefs, pictures, or ideals about what parenting should look like allows endless possibilities to unfold and invites a more open acceptance of the way it actually is. This applies to the childhoodnature lens. When I have held on to pictures or beliefs about what this looks like in practice with my daughter, it creates a deficit where I am always away from where I want it to be. By confirming through appreciation about what childhoodnature looks like as it is, it allows the next learning and lesson to be presented, therefore allowing a deeper understanding and practice of childhoodnature in our lives. This chapter has detailed a selection of the SLEs that presented through my research that contributed to my everyday conceptions of parenting with/as nature. I view nature as a parent, offering constant guidance about how to live in harmony with human and non-human nature. I understand that my body-is-nature and speaks to me constantly. I can choose to listen and respect the universal order that my body belongs to or not. I have learned that as a human being I have this responsibility of choice, as does everyone. Through the sharing of our narratives and stories, we can learn from each other and, from our learning, discover new ways of experiencing and understanding nature in our lives. The role of nature in my life has changed and developed over time; my SLEs mark these changes. This evolution and changing relationship highlights the possibilities for reconceptualizing the human relationship with/as nature to match the evolving nature of all living things on the planet. I accept that the nature we are living with and experiencing is the result of the collective choices of humanity. Through the autoethnographic process, I have been enabled and empowered to deeply reflect on how my relationship with non-human nature has changed over my lifetime from a place of being to a place of refuge and escape to now, nature as a parent. Autoethnography has allowed my perspective as a parent to be considered from the inside, contributing rich, authentic research to this largely unexplored area of the SLE field. Throughout this inward and outward exploration of both human and non-human nature, I have reconstructed, reimagined, and reconceptualized my approach to parenting with/as nature. This research suggests that to enable and embody an approach to parenting with/as nature that any beliefs, ideals, and pictures about what parenting with/as nature should, would, or could look like needs to be deconstructed. It is then through reconsidering and redefining human relationships with honesty, values, time, food, and perceptions of being in the world that the parenting with/as nature concept can be reconstructed. Practical implementation of these concepts and research findings requires each individual to (a) take responsibility for caring for their body-as-nature and listening to their voice within: their biophilia; (b) be the living inspiration for what they would like to see in the next generation; and (c) utilize each moment with nature by being present at every opportunity and deeply appreciating the messages and wonder that is on offer. Along with the nature of research, this knowledge and understanding is dynamic and will continue to evolve and deepen along with the collective us of human and non-human nature. Crutzen, P. J., & Stoermer, E. F. (2000). The “Anthropocene”. Retrieved from http://www.igbp.net/download/18.316f18321323470177580001401/1376383088452/NL41.pdf.